Eggs and chicken are nutritious foods that are high in protein, and they may help you lose weight -- as long as chicken and eggs aren't the only thing you're eating. The chicken and egg diet, which involves eating eggs and chicken breast every day, may cause weight loss, but it's not sustainable, healthy or recommended by doctors. Talk to your physician before making any changes in your diet, especially if you have health conditions or allergies. The egg and chicken diet, also known simply as the egg diet, has circulated around the Internet, but its origins are unknown. The diet is high in protein and involves eating approximately four eggs every day. For breakfast, dieters eat two hard-boiled eggs and half a grapefruit. For lunch, dieters eat a small, skinless roasted chicken breast and a green salad. 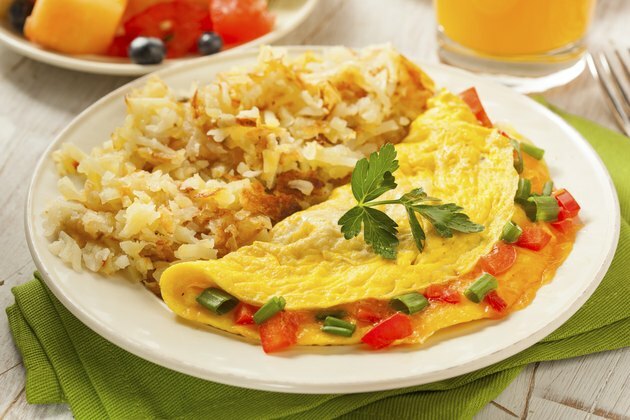 For dinner, dieters eat a two-egg omelet with tomato and spinach, but no cheese. The length of the diet is not specified. The egg and chicken diet is very low in calories. Dieters consume approximately 565 calories per day while following the diet, which is much lower than the recommended calorie count for adults, which approximately 2,000 calories per day. According to dietitian Andrea Wenger Hess in the University of Maryland Medical Center article "Common-Sense Strategies to Long-Term Weight Loss," dieters who consume fewer than 1,200 calories for men and 1,400 calories for women risk developing nutritional deficiencies and health problems. Enlist the help of a calorie counter to ensure you're getting the best quality nutrition each day. The egg and chicken diet is considered a fad diet because it involves eating the same foods over and over again. Additionally, the diet eliminates entire food groups, like dairy and grains. Any diet that involves eating only 565 calories per day will probably cause drastic weight loss, because you are essentially starving the body. When you return to your usual eating habits, much, if not all, of the lost weight will return. Additionally, eating four eggs a day may cause other health problems, like high cholesterol. The egg and chicken diet contains about four times the recommended daily cholesterol intake for an adult. Instead of limiting yourself to a strict diet of eggs and chicken, focus on eating a variety of healthy foods in moderation. Stick with mostly whole grains, lean protein and fresh fruits and vegetables to stay full on fewer calories -- burn additional calories by exercising most days of the week. This way, you'll be more likely to stick with your diet and exercise plan, because you can actually maintain it in the long run.